ExcUsE mY frEnch: Happy birthday ! 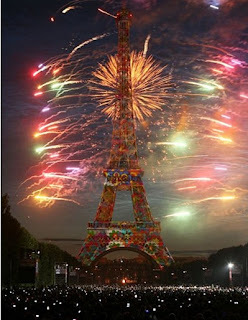 She's really my favorite monument in France. Wow ! Quelle classe ! Un peu triste d'avoir raté ses 120 ans. Tant pis j'y serais pour ses 130 ans,c'est promis ! 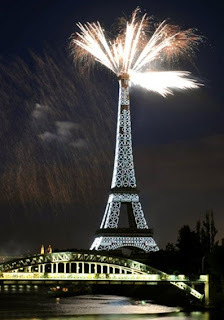 Happy Birthday Eiffel Tower! I went to Paris only once for a few days over ten years ago, but I didn't even go to their because I was afraid it would be too crowded with tourists (as Notre Dame was...) I need to go back to the city sometime soon though because it was very beautiful! je découvre ce joli univers créatif ce matin avec grand plaisir !